The original Double IPA! Vinnie Cilurzo began homebrewing in 1989 while in college. In 1994 Vinnie started the Blind Pig Brewing Company in Temecula, CA, a small, low-budget mico-brewery known for their extremely hoppy IPA - an IPA which won silver medals at both the Great American Beer Festival and the World Beer Cup. Vinnie sold his share in Blind Pig and was hired to manage and brew at the Russian River Brewing Company, a start-up brewery by Korbel Champagne in Guerneville, CA. In late 2002 Korbel decided to get out of the beer business and sold the Russian River name and brand to Vinnie who is moving the brewery to Santa Rosa, CA, 90 miles North of San Francisco, where he and his wife Natalie are opening a brew-pub which will serve homemade pizza and, of course, all of the Russian River Ales. Vinnie has won 10 awards at the Great American Beer Festival in the past six years and was named Small Brewing Company Brewmaster of the Year in 1999. 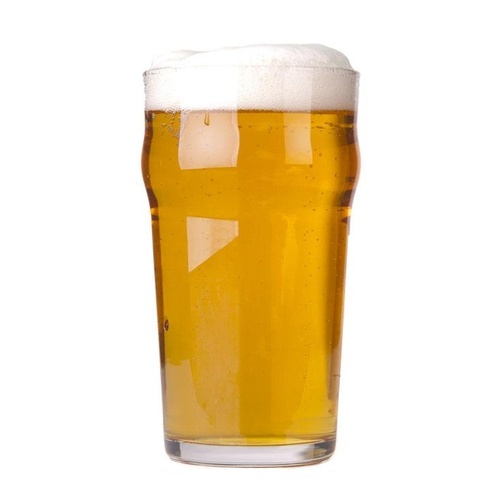 Almost every beer that Vinnie makes commercially started out as a homebrew recipe at one point or another. Even as a professional brewer, Vinnie still homebrews at least 5 or 6 times a year. 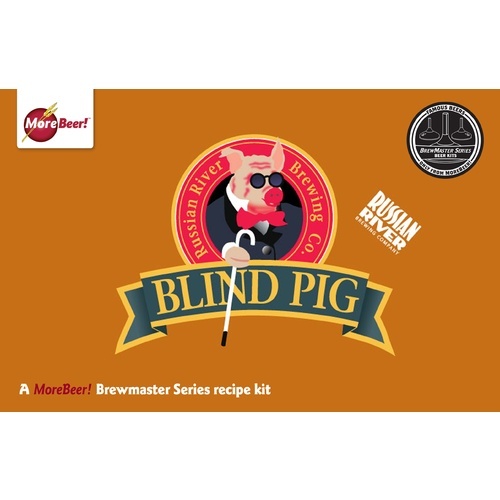 This is the original homebrew recipe that was the basis for Blind Pig IPA which won Silver Medals at the World Cup of Beer and the Great American Beer Festival in 1996, the last year Vinnie brewed it. Two 'dry hop' additions along with 1 oz of American Oak are added directly to the fermenter after the first week of fermentation. To say it is a very unique, extremely flavorful IPA is an understatement. Vinnie recommends using White Labs California yeast, WLP001. Better than Pliny. Underrated brew. Outstanding beer from one of the best breweries I've visited! Best beer ever made. I cant keep it on tap for my friends. Might have to switch to all grain because they are drinking it to fast. More beer recommended this item, I trust their opinion and they are always there when I need help. It's really good. Brewed before. Sounded like a great beer kit! I have brewed this kit twice and it came out great both times. The second time I switched the hops around by mistake. I put the cascade in at the beginning of the boil and added the Magnum when I was supposed to add the Cascade. It came out great I like it better than the way than what the recipe calls for. I should change ingredients up more often. Did it taste like Blink Pig? Not really. But it made for a really good IPA. Just the correct amount of oak for a smooth hoppy beer. Have brewed this many times and will continue to brew it. Wish the LME was in 'milk jugs' versus the ziplock bag style containers. Would be easier to handle and pour. We made this recipe because we are trying different flavors in our secondary. After two weeks in the bottle though the oak was strong and up front, after another week it really mellowed to a good drinkable taste. Have only been kegging a few months and have found that the keg flavor is more defined, can taste the different grain and hops more than in the bottle. The color of this beer is really different too, it's about the color of the malt extract, deep golden syrup brown. All in all, a pretty good, drinkable beer. Best Clone I have ever made and will brew this at least once a month in 2x, 3x batches! It is amazing! So I am sorta new to homebrewing. I have recently ventured into all grain and fermentation temp control. When I brewed this, I wasn't even that far. I have never had a 5 gallon batch vanish in one night before I brewed this! I followed everything but my numbers were still high OG with an extract full boil. No biggie in my book. I dry hopped for 8 days and added the oak chips for 4.5 days. First time dry hoping, using oak chips, and my first IPA btw. I live in Temecula so I thought this would be a great homage to Vinnie and local gastropubs always seem to have RR on tap. Good comparison for when I finished. I waited a week after bottling and I loved it. Two weeks and I wanted to marry it. 3 weeks I shared it with some friends and had to smack their hands so they would drink the beer they brought. That isn't normally like me! I felt such pride in this homrebrew clone that I was left with only 6 bottles. I found a place that had the real Blind Pig on tap and didn't charge me a corkage fee for bringing mine in to taste test because they wanted to compare too. Both were great beers but the real Blind big was more dry and bitter. Mine was more malty and oakey. It was a toss up and I lost to the loyal fans who flock to this brewery but I personally like mine better. It was very well rounded, had a nice oakness to it which was seriously so good, and more malty goodness than dry bitter hops. To each their own but you have to try brewing this! So good!! I want to do a double or triple batch for the holidays. Never has anyone responded so well to my homebrews as they have to this one. Hoping it will fall off in a week or 2, but the kit includes way too much oak for this recipe. I would cut it down to a quarter of what the instructions say and cut the time back as well. Completely overpowers any other flavor. Underneath the oak I can almost smell what this beer should taste like, so possibly I would make this again but skip the oak. It also needs a bit more in the dry hop department. Nose it lacking. This is more an ode to blind pig than a clone. I have had the real thing and this ain't it. A month later, do you still think the oak needs to be cut down or did it just need some extra time to sit? How long did it take to taste good after brew day? Good but needs a little time. I brewed this on 11/8/15. I am now drinking this on 12/19. It really took this long for the flavors to come together. As others have said the oak was overpowering at 3 weeks old. now at 6 weeks it has a great aroma and taste. I am dry hopping a few ounces of whole cone cascade in the keg which helps from losing that hoppy beginning. A solid $40 beer kit. After reading other reviews I decided to only used 1oz of Oak Chips for 4 days after 10 days in the primary. It came out with a medium flavor from the chips that wasn't bad at all but after bottle conditioning for a week in the cupboard then another few in the beer fridge the flavor was really mild and you could taste the hops just as much as the oak chips. All in all I would say it is a really good brew that is nice for a quiet late night. easy to brew also without having to use actual grain. As with other Russian River kits I was very impressed with this recipe. Turned out great. I love this beer. My friends love this beer. I brew it and it literally disappears seemingly overnight. I don't even advertise when I brew it to keep it around longer, but I think they can smell and/or sense it. I have brewed both with oak and without oak and can say that both are delicious! I wasn't sure about the oak when I first brewed this recipe, but I can say that it changed my mind about adding oak to beer from hesitant to OH YES! I still brew with and without out depending on my mood. Brew it and I guarantee that a friend or family member you haven't seen in forever will show up on your doorstep to help you drink it! Like Magic! After reading some of the reviews I wasn't sure I made the right choice buying this. It turned out far better than I expected and unlike normal I stuck to the recipe. Not that I am opposed to extract but I will be making the all-grain version next time. this is the kind of beer I make beer to drink! full flavor complex finish and fully drinkable as far as I am cocerned. I pulled the oak before the suggested time and still felt like it overwhelmed the beer. I'd use 1/2 the provided oak and taste every couple of days. As other reviewers have stated, the oak flavor is INITIALLY overpowering when you follow this recipe. It was so strong 3 weeks after bottling that I really didn't care for it and it sat in my basement for 5-6 weeks. That's not always a great idea with a dry hopped IPA, you want to consume it while it is fresh and the aroma is strong. So after several weeks the oak flavor has mellowed nicely, the hops aroma has decreased but overall the flavor and aroma balance is much better than it was 3 weeks after bottling. Russian River brews are not available in Ohio so I have never had the commercial version of this, but it is very good 6 weeks out from bottling. This is a great kit that produces amazing beer, tho you have to exercise caution with the oak chips, it says to put them in way to early, i wouldn't put them in any longer than 1 or 2 days. Otherwise the oak takes over and makes it a little unpalatable. I brew double batches every brew day to save time. I was a little concerned about the wood chips. I didn't want ten gallons of something I didn't like. So I made one batch with the Oak chips and one batch without the chips. After about six weeks to two months in the keg, I must admit I like the keg without the oak much better. Will brew again. This was my first brew and I missed it so severely when it was all gone is started sucking my thumb. I enjoyed the oak flavor and hoppy goodness that make this beer so good. Making beer is easy and fun. Very very tasty kit! I brought a keg of this camping and it didn't make it to second night. This is very good! Delicious beer thanks to Vinnie! And a breeze to brew! Great taste, one of my first batches but came out a little too malty, hop flavor was a bit subdued. This was probably my fault as my first few batches came out that way. Love this beer from RRBC and I felt like the kit was a good rendition of their classic IPA. Good ingredients, easy process. If you like Oak aged beer, then you will love this brew. Tasted one a week for 5 weeks now, and this definately is one I would let age as the oak blends into the beer. For your friends that enjoy IPA's this is a must brew, and it will surprise as the Oak adds a unique flavor most have not experienced. flavor was good but using that much extract left a honey like big beer after taste. Overall, a good kit and my friends loved it. Not like the Pliny, but a solid IPA. Bought it as a Deal of the Day and definitely worth the money. This took 2.5 weeks to bottle condition just right and now it's one of our favorites and one that we will be brewing again and again. There is a nice malt backbone and a strong grapefruit peel flavor that is unusual and just...Yum!